Form No. 4.-100 - 17.8.10. Delivery Date 15 APR 1912. No. OLYMPIC, Handed in at PARISIAN. To : CAPTAIN OLYMPIC Received 12.50 pm NYT. 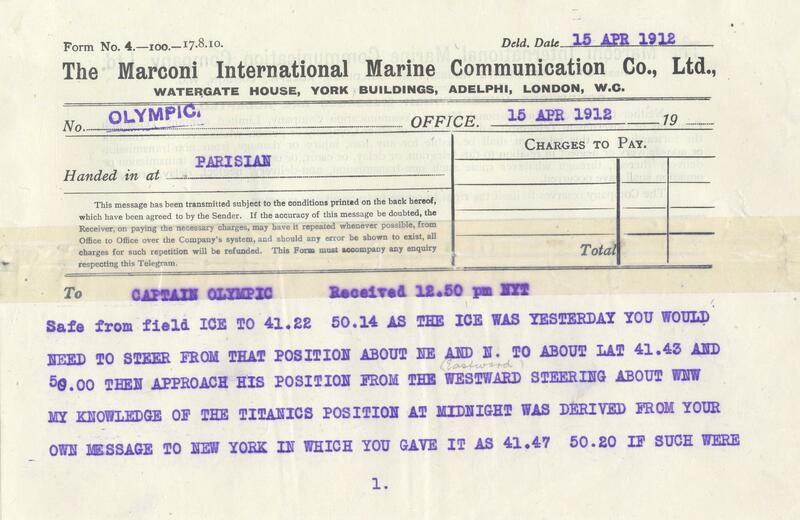 Safe from field ICE TO 41.22 50.14 AS THE ICE WAS YESTERDAY YOU WOULD NEED TO STEER FROM THAT POSITION ABOUT NE AND N. TO ABOUT LAT 41.43 AND 50.00 THEN APPROACH HIS POSITION FROM THE WESTWARD STEERING ABOUT WNW MY KNOWLEDGE OF THE TITANICS POSITION AT MID IGHT WAS DERIVED FROM YOUR OWN MESSAGE TO NEW YORK IN WHICH YOU GAVE IT AS 41.47 50.20 IF SUCH WERE CORRECT SHE WOULD BE IN HEAVY FIELD ICE AND NUMEROUS BERGS HOPE AND TRUST MATTERS ARE NOT AS BAD AS THEY APPEAR. REGARDS HAINS.